Zeiss today announced the 55mm f/1.4 Otus lens, a close-tolerance and no-compromise image quality optic for Nikon DSLRs (a Canon version was also introduced). The lens is described as having outstanding sharpness, high contrast, and no visible chromatic aberration, even at maximum aperture. As Zeiss last year hinted, all their lens lines are getting names. The Otus name is based on a Latin name for an owl known for its night vision, and apparently is the new name for highly corrected fast DSLR primes. Ironically, in the same paragraph explaining that, Zeiss indicates the lens is "especially suited for" advertising, fashion, and studio photography, almost all of which is done in substantive light. What those folks want is actually depth of field isolation without compromise. If the new lens performs as well as Zeiss says wide open, then mission accomplished. But maybe Glamour would have been a better name for the line of lenses ;~). This is not a small or light lens (see data page). As Zeiss notes it is for photographers "who do not accept any compromises…for more compact gear." Nor is this an inexpensive lens, at US$4000. It's also a manual focus lens (containing the ZF.2 chipping to provide exposure information to Nikon DSLRs that Zeiss has been doing for awhile). I'm a little put off by the wording Zeiss is using in their marketing push on this lens. For instance "the uncompromising quality of medium format systems — for an affordable price." Okay, that's US$7000 or so for a camera and lens that just covers the normal field of view and delivers 36mp images. Yes, the price is less than an equivalent MF camera and lens, but it would have been nice to see some better visual evidence of the claim. Also, there's the issue of where the quality comes from in the MF systems Zeiss is talking about. Generally, the MF normal lens is less expensive than this new Zeiss. Zeiss is actually referring to the affordability of the Nikon DSLR body, not their lens ;~). MTF and other charts were curiously missing from the press release (though they can be found by going to the Zeiss site and looking for the data sheet for the lens). Those charts show a lens that performs very well. But Zeiss keeps using words like "perfection" in their descriptions, which feels a bit too much like hype to me. A better choice of wording would have been something along the lines of "image quality parameters equal to or exceeding that of other DSLR lenses." 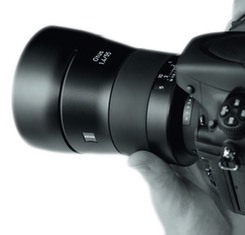 In other words: arguably one of the best lenses you could consider in terms of performance. This isn't helped by Zeiss beta testers writing things like "You really, really, really want this lens more than any lens you ever lusted over" right before giving an affiliate link to order it from. The 55mm Otus is a "normal" field of view on an FX DSLR. Do you really lust after a normal lens? I'm trying to think when the last time I used anything in the normal angle of view for a shot I made. Ah, it was with my 58mm f/1.2 NOCT shooting night skies, not something I do a lot. "Lust" has a (second) definition of "a strong desire for something." (The first definition is "a strong feeling of sexual desire," which I hope that no one is having over any lens.) I question how many people really, really, really have a strong desire to spend US$4000 for a normal lens just so that they can make their D800E into poor man's MF studio camera. Don't get me wrong. The 55mm f/1.4 Otus looks like an excellent lens, and it very well may be the best corrected normal lens we can mount on a Nikon DSLR today. But instead of lusting for it, why not consider what your real needs are and buy appropriately? This is not a lens I'm considering, for instance, though given that Otus is a new lens line, I suspect there may be a focal length Zeiss produces in the future that is something I need (hint: make it a 24mm).